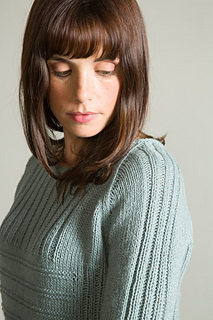 Rib and ridges alternate in perfect proportion in this raglan pullover. 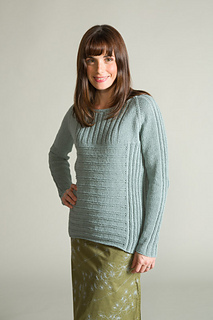 Knit in pieces from the bottom up and seamed. S (M, L, XL, 2XL). Shown in size M.
Knitting needles and circular knitting needle (16”) in size US 7 (4.5 mm) or size to obtain gauge. 18 sts and 27 rows = 4” in St st, blocked; 18 sts and 30 rows = 4” in Ridge patt, blocked; 18 sts and 32 rows = 4” in 2 x 2 Rib, blocked.